In February, the New York Times ran six short pieces on home birth in its “Room for Debate” online feature. I am going to discuss each of the pieces in posts over the next few days. Amos Grunebaum is the director of obstetrics and Frank Chervenak is the obstetrician and gynecologist-in-chief at New York-Presbyterian Hospital, Weill Medical College of Cornell University. Their work brings up a number of interesting issues to consider about home birth safety, but they also appear to conduct their research with an anti-home-birth agenda–Chervenak has written articles stating that it is unethical for MDs to participate in home births in any way and that it is the professional responsibility of all health workers to forcefully persuade women to birth in hospitals. All birth data in the United States has limits, but Grunebaum and Chervenak’s use of vital records data to draw sweeping conclusions about home birth outcomes has been broadly criticized (e.g. here, here, and here). [i]n our research we have found that in the United States at least 30 percent of home births are not low-risk and that two thirds of home births are delivered by midwives who are not properly credentialed. While I have argued that a woman has the right to birth wherever she chooses, regardless of risk, one might ask why a woman at high risk would choose to give birth at home when she has a hospital as an alternative. Some women may be compelled to do so for religious reasons (and may not have full control of their choices), but it is also true that some well-educated, well-informed women also make the choice to have high-risk births at home. Grunebaum and Chervenak acknowledge some of the problems with hospital-based obstetrical care that drive women to seek out home births even when their medical profiles indicate that they may need the kinds of medical interventions that are only available in a hospital-based setting. They particularly note high numbers of “unnecessary C-sections” and lack of “compassionate care” in hospital births. We know from his bio that Chervenak is in charge of the obstetrics unit at NY Presbyterian-Weill Cornell Medical College (NYP-WC). If women are to shun home birth in favor of hospital birth, a good hospital environment must already be in place. Let’s take a look at what he and his colleagues are doing to reduce unnecessary C-sections, provide compassionate care, and strive for home-like settings. New York state now requires hospitals to report certain data, including C-section rates. NYP-WC’s is 31.6%, a smidge below the national average, but hardly indicative of a culture that is eschewing unnecessary C-sections. For the last year reported, there were only 38 VBACS at NYP-WC. NYP-WC’s episiotomy rate is a whopping 25.7%. Episiotomy is rarely necessary, and this rate is far, far above the home birth rate of under 2%. According to a 2005 JAMA review by Katherine Hartmann and her colleagues, a national episiotomy rate of less than 15% should be “immediately within reach”–10 years later, NYP-WC is not on board, even though the national rate was already close to 15% by 2010. Nearby Bellevue Hospital has a rate around 2%. Compassionate care should not include cutting gashes in women’s vaginas for no reason. Grunebaum and Chervenak brag that “we have a midwife teach our residents at NewYork-Presbyterian.” However, they do not employ midwives to attend births. Zero births at NYP-WC are attended by a midwife. In addition, because they are a teaching hospital, NYP-WC has many births attended by residents whom the woman may not even know. No one invites complete strangers into their home to attend their births. Most women who have home births are seeking the Midwives Model of Care, but though Grunebaum and Chervenak acknowledge that CNMs can safely attend hospital births, they choose not to offer this option. The hospital’s maternity unit has a “Patient and Visitor Guide: During Your Stay” that lays out standard processes and procedures on the unit, gives prospective patients an overview of what to expect, and lays out hospital and maternity unit policies. The guide begins by saying that the hospital offers “Family Centered Care,” though what this means is not explained other than to say that rooming-in with the baby is encouraged. They proceed to say that the woman’s care team may involve “your attending obstetrician, who is often your personal obstetrician or the doctor who admitted you, …[and] other medical or surgical specialists, as well as fellows or residents…[and] a pediatrician.” But that’s just the doctors! They say that the nursing staff is “constantly present” and indicate that there will be many nurses involved in care. Other people involved in the hospital birth experience are care coordinators, unit clerks, physician assistants, lactation consultants, social workers, dieticians, nutrition assistants, housekeepers, patient escorts, and volunteers. There is also a Rapid Response Team for emergencies. I don’t know about you, but I’m not sure that many people could fit in my house. spacious and light-filled birthing rooms [that] combine comfort with leading-edge technology. All suites are private and equipped with a special multi-positioned birthing bed, as well as state-of-the-art equipment for monitoring and delivering your baby. Your progress will be monitored regularly throughout labor, and your nurses will help you explore which comfort measures work best for you. My home has a queen sized bed. The most leading-edge technology in it is my iPhone. The intensity of discomfort during labor and delivery varies from person to person. Some women may manage well with relaxation and breathing techniques. However, most women choose some type of pain relief. 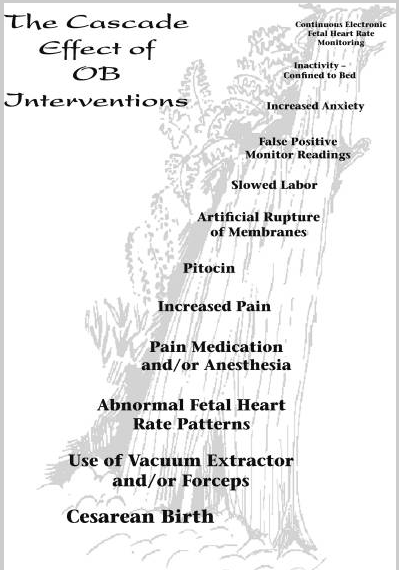 The majority of women receive analgesia (relief from pain without losing consciousness) from an anesthesiologist….The most effective methods for relief of labor pain are regional anesthetics in which medications are placed near the nerves that carry the painful impulses from the uterus and cervix, lessening pain and facilitating your participation in your delivery. Our anesthesiologists commonly use an epidural, spinal, or combined spinal-epidural to minimize pain. Nothing is mentioned other than relaxation, breathing, and calling the anesthesiologist. However, in home settings (and even at other hospitals) many women choose “pain relief” from any number of options that do not require an anesthesiologist, such as walking, changing position frequently, sitting on a birth ball, taking a warm shower, or submerging in warm water. They may also get pain relief assistance from massage or from non-drug-based interventions such as acupuncture. This is not a complete list. It should be noted that all of these other options could be made available at home–the only one that could not is the anesthesiologist. No mention is made of the risks of anesthesia nor of what can be done in the event that the epidural or spinal doesn’t work. Choosing pain relief does NOT have to mean choosing an epidural–unless you are at this hospital, where according to the state more than 85% of women have epidurals (and that doesn’t include spinals and other medical methods). your nurse will assess your blood pressure, pulse, and temperature, and place you on a fetal monitor. The nurse will monitor you throughout your labor and help you explore which comfort measures work best for you. An intravenous line may be placed to give you medication and fluids. You may also receive ice chips to help quench your thirst. Do not eat any food without your physician’s permission. According to the Cochrane Reviews, continuous electronic fetal monitoring (EFM) in low-risk births increases a woman’s risk of an unnecessary C-section. Because the risks-benefits ratios of EFM and intermittent auscultation, in which a health care provider listens to the fetal heart rate with a Doppler or fetoscope at regular intervals, are similar, Cochrane recommends that women be given information and then choose for themselves. IV fluids can also lead to complications, such as too much fluid in the mother or newborn. In addition, having an IV in place is conducive to starting a cascade of interventions, as having the IV in place makes it easier to begin a Pitocin drip. Only two people can be with the woman in labor. Last I checked, I was allowed to have whoever the heck I want in my house. The hospital does not allow videorecording of the birth. At home, you could live stream your birth if you were so inclined. Rooming in is offered but not required. Obviously at home, there is no nursery staffed by nurses. In addition, rooming in is the standard for Baby Friendly Hospitals, as non-medically necessary separations can negatively impact breastfeeding. One of the things many women appreciate most about their home births is the freedom to move around and to birth in any position they choose. An acquaintance of mine who had an accidental home birth said that although she hadn’t planned it, she liked the experience, especially because “no one made me get on the little table.” Another acquaintance said that as she was birthing, her OB asked that she get on her back for each contraction because, the OB said, “that’s the way I prefer to deliver.” Still another friend said that although there was a squat bar available in her birthing room, her OB refused to let her use it and threatened to leave if she would not lie on her back. Notably, NOTHING is said in the guide about freedom of movement or position during labor or birth. If a woman is tethered to a monitor and has an epidural, her movement would be curtailed even if hospital policy did not restrict her. Follow the treatment plan recommended by the health care team responsible for your care and the care of your baby. This group may include doctors, nurses, and allied health personnel who are carrying out the coordinated plan of care, implementing your doctor’s orders, and enforcing the applicable Hospital rules and regulations. In your own home, you make the rules. If Grunebaum and Chervenak want women to choose their hospital’s maternity care over a home birth, they’ve got a lot of work to do. You’ve effectively addressed here all the reasons why I chose a home birth over a hospital birth, even though I had to pay for my care entirely out of pocket. I lived in Illinois when my son was born, where birth centers were not an option (the state just recently got its first free-standing birth center; if I had wanted a birth center, I would have had to drive more than an hour across the border into Wisconsin). All of the nearby hospitals that took my insurance required continuous fetal monitoring, restricted food/drink, forced either an IV or a heplock, had high rates of epidural and episiotomy, could not guarantee which doctors/nurses would be there for my labor/delivery, did regular vaginal exams, and generally frowned upon natural birth. The closest hospital available to me with midwives on staff was an hour away. When I first started researching birth, I didn’t know it would lead me to home birth; I didn’t know what exactly I wanted, but I did know what I did not want. In the end, I had a beautiful, perfect, empowering home birth. After that, short of actual medical risk, there’s no possible way I’d choose to birth any other way.